Im proud to say that I saw Tyler Perry’s play, Madea’s Big Happy Family 3 times. I decided that I was going to post a recap of all the shows once I attended last nights show here in Detroit at the Fox. Atlanta Georgia….7:59pm April 16, 2010, we were walking down the aisle to our seats sitting 2nd row from the stage in the Orchestra Pit, smiling like we were friends and family of the cast. The place was jammed pack. We were so scared that the lights were going to go down on us and Madea was going to tear us apart. At 8:00 we had just sat down. We were smiling from ear to ear that we were that close to the stage and to Tyler Perry and his cast. To this day we still can’t understand how we scored those seats and we both live in Detroit. We hadn’t plan to visit ATL in April, we were planning to go there in March. But one night when were on the phone discussing our plans, I decided to go to Ticket master to see what seats they had left, I was surprised to pull up BBB seats. They were $122.00. I looked at the seating chart and couldn’t believe how good the seats were. I said to my friends, we’ve got to go to this play in April. Tyler is home and he’s going to show out!! They agreed. We had to gathered our money together, and the very next day we went on line and pulled up row CCC. That was cool ,and that’s how the tickets came about. We bought those tickets in DEC of last year. The show was Fantastic!!! We felt like giggly kids. Every time we thought Tyler was looking our way, we nudged each other legs, especially on the scenes when the lights went down, and the focus were on other cast members. WE knew he wasn’t, but it was fun watching him look our way. I loved how the play opened with People make the world go round. I can still hear the music beating in my heart. Everyone was on point. When they each had a turn to sing, we were tripping on hearing Betty Wright, cause we had been bumping that the minute we touched down for Hartsfield. We went crazy when Cassi sung that, because it was her CD we were playing. That was a TREAT!!!! I just love Cassi Davis, and I love to see her and Madea * Bonnie and Clyde*. She calls Madea …..Dea, and I find that so funny. Don’t ask why. LOL I would have thought he would call her Ella. I really really enjoyed the singing. Tyler know he needs to put these songs on a CD. I dunno why he won’t. People were Twittering about it too. When Chandra died, I kept wondering how in the world did she get over to the middle spot wearing white so quickly. I finally figured it out. She sung the mess outta that song, and I love when she spread her wings. I couldn’t stop my tears from flowing. I kept thinking about my dad and how much I need to spend time with him. He has gotten so much better with his personality than in the past. WE didn’t get along at all growing up, and especially when I got grown and moved out. But now that he’s older, he must realized something in his life had to give, it was getting hard to be around him. But when saw this play, Tyler reminded me that if I don’t spend the time, that I could be one of those sitting on the couch crying over guilt. I DON’T WANT THAT!!! That was really a wake up call for me personally. I’m very close to my mother, but living with my dad and his control issues was not good for me. I was one of those kids who didn’t require all the hollering, and smacking upside the head, or long summer punishments. But I got them. So that play really made me appreciate that I need to get over my child hood issues with my dad, and just live life. When I returned home from ATL, we went to his doctor’s appointment and to eat. He was sooo happy, and I was too. Thanks Tyler for that one! After the play was over, we went outside on the opposite side of the Fox where Tyler’s buses were parked, we talked, and talked and talked. The night breeze was awesome out there. And all the 3 of us kept saying was……. here we are in ATL God, and we can’t even meet the man for a few minutes. AT times we sat and watch the crowd drive down Peachtree thinking about the play and the performances, we didn’t say a word. After the crowd died out, we walked to our truck and went to Gladys’ Knight and Ron Winan’s restaurant. We enjoyed the night life there while waiting to enter the building to have dinner. WE had a awesome night just being away from Detroit, and enjoying Atlanta. 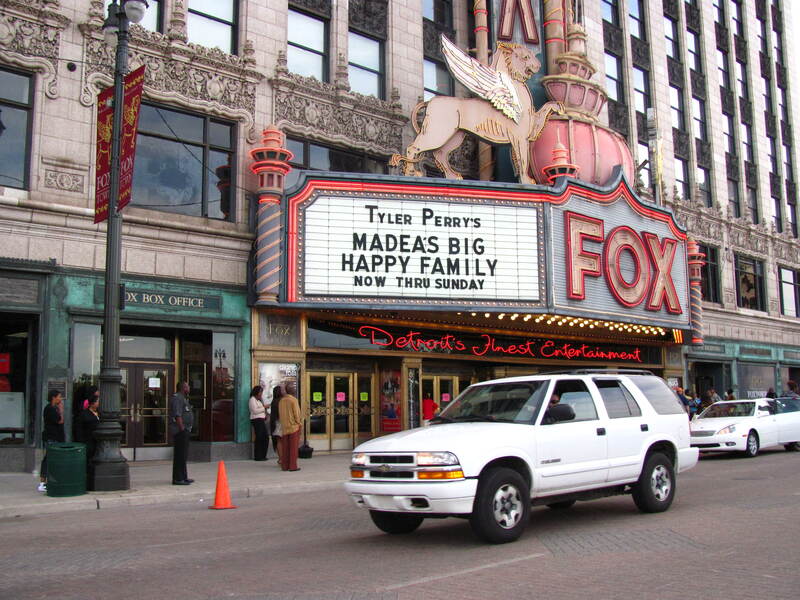 Tickets went on sale for Tyler Perry’s Madea’s Big Happy Family for Detroit back in Jan I believe. As long as I’ve been going to plays and concerts………. I know the first show is going to always be LIVE!!! I had to work this one morning tickets went on sale @ 10:00 for the first show which was on Friday night. See, I thought his first show was going to be on Thursday night, but he did it differently. The second those seats went on sale, they were shooting out these lame seats…….. talking about IRRITATED!!! LOL I vowed this year….. Lacrease will not be sitting in the back… waiting on people to give you their money…. naw not this play. Anyway, those tickets sold so fast. I was MADDD! I went to work thinking how could those good seats go so fast? When I got home I went on line to Ebay, this man wanted $1000.00 plus for Friday’s show. I kept bidding on them, BUT FOR REGULAR PRICE. He told me in so many words……….. gurl get lost!!! lol This Virgo sho did try. LOL Then weeks later………. JACKPOT……. tickets went on sale for the first show being on Thursday and not Friday. I went on line about bought tickets for that show….row F…. then my daughter surprised me with tickets for Mother’s Day… front row behind the Orchestra. Which I’m mad about. When tickets went on sale, they said NO PITT SEATS the band was going to play in there. 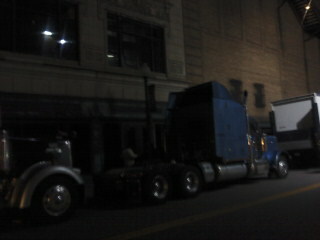 When I got to the play, I was mad/shocked to see 2 rows of the Pitt. So, the Virgo in me , asked this couple that was about to sit down, when did they purchased their tickets,………… know what he said? 2 days ago!! And yall sitting in the PITT………. AIIGHT! THE LIGHTS WENT OUT and those people were going Bananas!!!! The lights wasn’t even down good and people were going crazy for Tyler. Screaming, clapping, stomping, whistling and hollering!!! I was looking around at the crowd like OMG………… ALL THIS LOVE….. DETROIT IS SHOWING THEM. I know his mom had to be smiling down on her baby. I think he did more adlibing on that show than any of the others I attended. The way he picked that gurl up by the neck,………. Tyler is strong!!!!! OOO weeeeee. He is so funny. Hitting those R’s in Cosmertolergy lollllll That ghetto gurl was soo funny too. I also liked how homely Cheryl Pepsi Riley looked, then she transformed….. that was nice. I enjoyed the whole cast. I cant think of anything that should have been done differently. The play was very long it lasted 2 1/2 hours. THATS WHAT I LOVED MOST…..it was long and still I didn’t want to leave. The messages about seeing someone that did something to you, and when you see that person again you will either let him still have that power, or forgive him and take back the power. That was really personal for me. God told me that the guy who raped me , when I was 17, was getting out of jail soon, and since we know the same people, he would come in Walmart and get in my line. I posted this before it happened ( proof is good), and don’t you know it happened just the way God said. When I first saw him, he walked up behind me as I was ringing up a customer, he jokily said……. maam can you tell me where is such and such? I turned around to tell where, and it was him. Blew me away…. for only a quick sec. God kept telling me to calm down… I did too. He said T is with me, Imma go shop and be back. When they came back…… my heart wasn’t beating like I thought it would, and I looked him in the eye, and not once did I feel my Power leave me. Not once. I thought I would turn and run out the building, but I didn’t. It happened just like God said it would. I showed God much love on that. He didn’t even have to give me heads up. Its even posted on line. So I really appreciated that from God. As the show came to an end on Sunday in Detroit, I was really scared to see Tyler. Knowing his mom wasn’t with him. I just wanna know how can he want to do a play when all of this is going on? He wants to make US LAUGH, in the middle of him grieving? That is soooooooooooooo UNSELFISH of him. But he did say he needed us. Well we need him as well. I need to laugh daily, and I laughed all 3 nights…….. Hard!!! As bad as I wanted to meet Tyler…….. God kept, kept kept going over it with me… why I cant at this time. I don’t understand what God told me, but I do TRUST HIM! While waiting outside of Gladys’ Knight and Ron Winan’s restaurant on Sunday after Church, I looked over at one of the 2 guys who were talking to each other, and noticed that they were wearing Tyler Perry’s Madea’s Big Happy Family All Access Passes on their clothes. The friendly Virgo in me/us went over to talk to them. They were 2 white guys, soooooooooooooooooooo nice and soooo friendly. One is for sure Carl, and I think the other is Mark. We didn’t ask about Tyler, didn’t want to invade on them like that * cant stand people who does that*but we did ask them what did they do. They were the guys who drive the truck NOT LOAD OR UNLOAD the stage set.They were the ones who told us that Tyler was going back out in September. We DIDNT KNOW THAT. But he probably shouldn’t. He needs a break, he really does. They were sooooooooooo cool. They got called in first, then we did. As we were leaving we saw them walking back to the Fox for the 3pm show. Talk about ACCESS! LOL Wow, wished we were there for that one!! I like to meet good people like that. One of the highlights for me was the fact that Detroit showed TYLER PERRY AND HIS CAST SOOO MUCH LOVE!! I was very happy about that. Very! If Tyler decides to step back out for the last leg, YA BETTA GO!!! CREE WILL BE IN THE HOUSE!! !